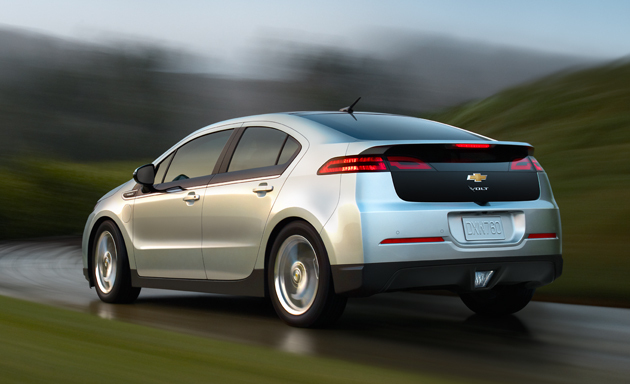 The Chevy Volt. Photo by Chevrolet. Attentive Source readers will recall the 1990s when electric car charging stations started popping up around California, the hope being that the state was on the verge of an electric car revolution. For a number of reasons — car manufacturers resisted because of concerns over manufacturing batteries and the state rescinded its own electric car mandates, to name two — it never happened. The next charge looks to involve plug-in hybrid cars that can run on electricity but also have an internal combustion engine to help extend a vehicle’s range. The much talked about Chevy Volt is one of those type of cars and is supposed to go on sale later this year, according to the Chevrolet website. Other manufacturers such as Toyota have also said they are working on plug-in hybrids. Metro has received a $415,000 energy grant from the California Energy Commission to explore ways for making it easier for drivers of electric cars to charge their vehicles at Metro facilities with the expectation that these commuters would take Metro to work while their car batteries recharge. The grant will fund a pilot project to assess the feasibility of mass installation of electric vehicle plug-in charging stations at Metro transit stations. There are currently four electric vehicle charging bays at Union Station in downtown Los Angeles. Metro will be upgrading those plug-in chargers while also installing charging facilities at the Metro Rail Universal City station on the Metro Red Line and the Sierra Madre Villa terminus station on the Metro Gold Line in Pasadena. There also will be plug-in chargers installed at the LAX/Aviation Metro Green Line station and the Canoga Station on the Metro Orange Line. Metro has a long-standing commitment to clean energy. More than 95 percent of its fleet of more than 2,500 buses run on compressed natural gas, and Metro Rail is powered by electricity.